This collection consists of 12 oral history interviews conducted with 11 OSU faculty members and one undergraduate student that focus primarily on scholarly research related to climate change and global warming. The sessions take on the form of life history interviews that trace a given narrator’s entire professional life, with particular attention paid to academic work and attitudes concerning ecological topics. All of the collection’s interview have been contextualized and made available online through a dedicated web portal. This collection is comprised of approximately 150 letters sent by soldier Benjamin Cook to his wife Julia during his service in the Union Army in the Civil War. His letters provide a first-hand account of certain battles and events in the Civil War and detail his life and concerns as a soldier. The finding aid includes a item-level description of each letter. These records document the employment of faculty and staff by Oregon State University and its predecessor institutions through 1989. These records are in the form of microfiche film jackets. This collection consists of a set of 6 interviews featuring 10 members of the Indian-American community in Corvallis. All interviews were conducted in Corvallis, Oregon by Sravya Tadepalli, a student at the University of Oregon at the time she completed the project and with family living in Corvallis. All of the digital recordings of the interviews are available online. These records chronicle the establishment and emergence of Oregon Tilth, Inc. from Tilth, which originally was established in 1974 in Washington State. Oregon Tilth, Inc. is an organic agriculture certification and education organization based in Corvallis, Oregon. The materials reflect the growth of sustainable agriculture in the Northwest and later, globally. The collection includes Oregon Tilth board materials, newsletters, audio recordings, video recordings, manuals, photographs, the organization’s websites, and educational materials. 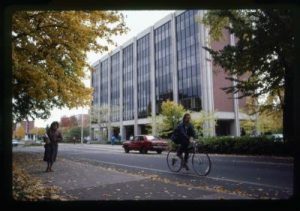 The Payroll Records consist of computer output microfiche of the payroll register for all Oregon State University employees – faculty, staff, and students – from 1971 through 1998. 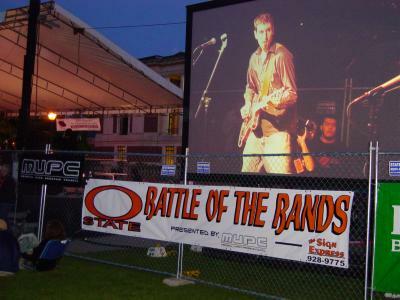 The microfiche was produced by the Oregon State System of Higher Education, which provided administrative and institutional services for the public universities and colleges in Oregon. 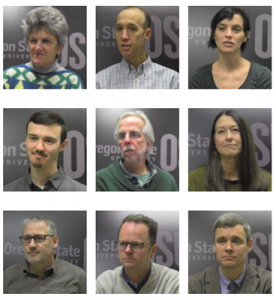 These materials document the establishment and functioning of this program to incorporate writing across the curriculum at Oregon State University. The collection consists of published newsletters and the program’s website. The Writing Intensive Curriculum was established at Oregon State in 1990 as part of the Baccalaureate Core Curriculum. Vicki Tolar Burton has served as Directory since 1993. 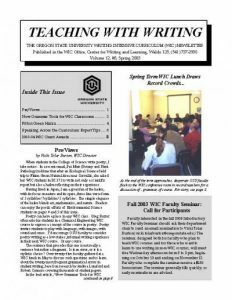 All of the published issues of the Teaching with Writing newsletter are available online. The Marian Field Collection is comprised of botanical illustrations produced by Marian Field, an Oregon artist and botanical illustrator. 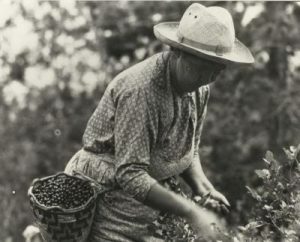 The illustrations in the collection appear to have been generated by Field between 1933 and 1941 in collaboration with faculty at the University of Oregon and the Works Progress Administration (WPA). The collection includes approximately 250 illustrations of plants and fungi, materials from an exhibit of Fields’ works, photographs, correspondence, and a short biography of Field’s life and work. The finding aid includes an itemized list of the drawings. These papers were generated and assembled by Helen Gilkey, an American mycologist, alumnus and professor of the Oregon State College Botany Department, and curator of the OSC Herbarium (1918-1951). 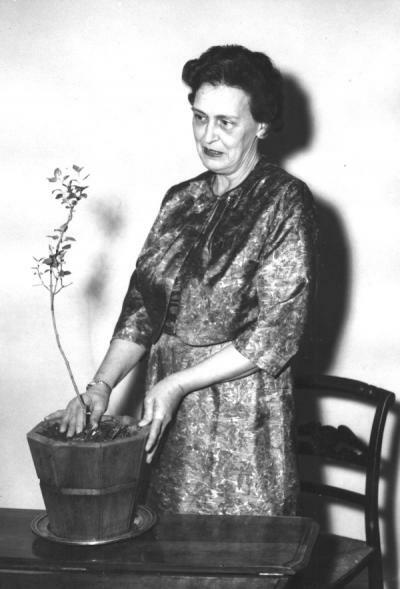 The materials include personal and professional correspondence; notes, research materials, and drafts of publications authored by Gilkey; specimen photographs; and scientific illustrations created by Gilkey. 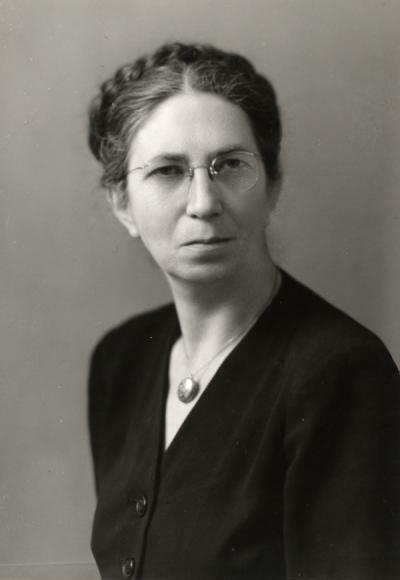 The Henley Papers document the life and work of Elizabeth Henley, a Pacific Northwest poet and member of the Oregon State University faculty from 1959 to 1975. The collection is comprised of research materials; manuscript and audio-recorded drafts of Henley’s work; published and pre-publication poetry; and personal materials including photographs, correspondence, newspaper clippings, and yearbooks. These records document the administration of the MUPC and its role in programming campus events. Primarily reflecting activities related to event coordination and publicity, this collection includes artifacts, budgetary documents, contracts, correspondence, digital files, flyers, handbooks, meeting minutes, photographs, posters, publications, reports, and scrapbooks. The MUPC was established in 1948. The collection includes 52 physical photographs and more than 2800 digital photographs; a VHS videotape; and 8.38 Gbytes of born-digital materials. These records document the administration of Student Leadership and Involvement (SLI) and its predecessor, the Student Activities Center. 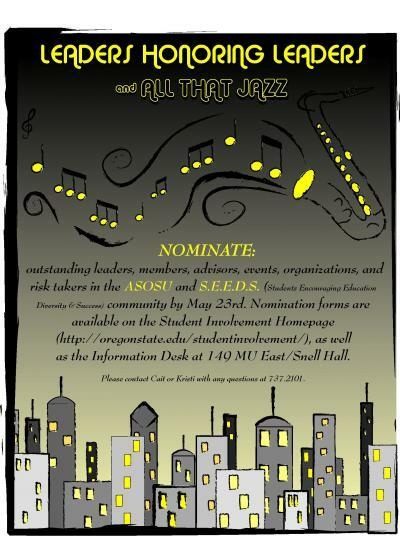 These organizations provide support services to student organizations through leadership training programs, event planning assistance, financial advising, and management of the annual student organization registration process. 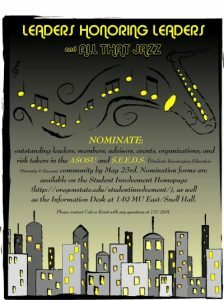 The administrative role that SLI fills was first established in 1957 as the Student Activities Center as a part of the Memorial Union. This collection includes 194 photographs, 4 VHS videotapes, 8 sound recordings and 653 Mbytes of born-digital materials. This collection consists primarily of black and white and color lithographic mounted postcards and photographic prints, some by well-known western photographers and studios. The images depict Native American culture in North America with a focus on the northwestern and southwestern United States, especially Alaska, Oregon, and Washington. Williams acquired the images in the course of his work as a Forest Service sociologist and historian and due to his interest in the history of Native Americans in the United States, especially that of the Pacific Northwest region. The collection includes 237 images; the finding aid provides item-level description of the collection. This entry was posted in Main Page on July 10, 2018 by dvoraka.